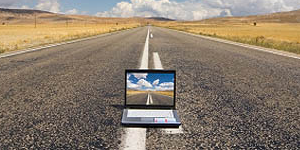 How many ways have you customized your ride? Aftermarket retailers like Bike Bandit or Revzilla offer endless options to customize your bike’s (or gear’s) functionality or aesthetic. 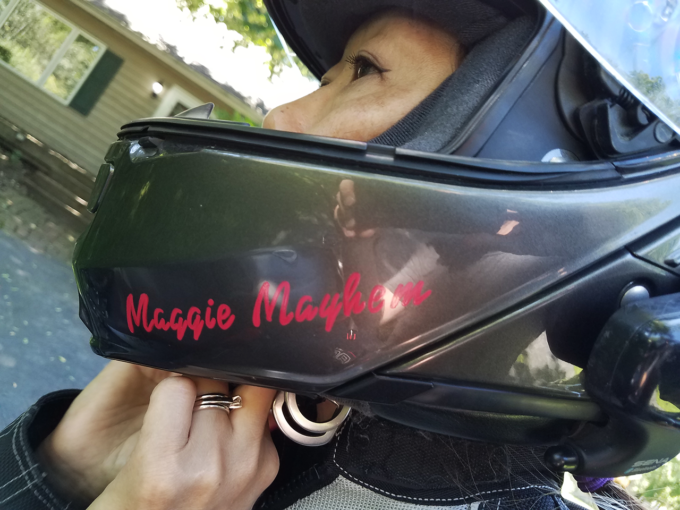 My husband, an MSF rider coach, came home one day and mentioned another rider coach in the office custom paints helmets. I looked up with my left eyebrow raised and thinking face on. 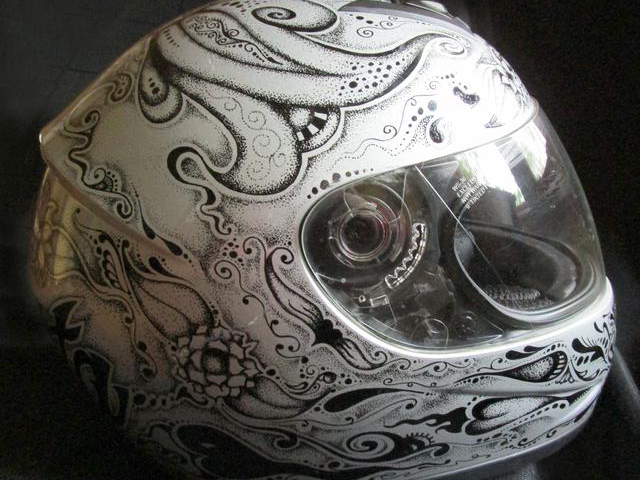 Hmm, interesting … but why consider painting my helmet? Custom painting isn’t just for racing professionals or the world of four-wheeled motorsports. It’s one of a kind wearable art. You can get your helmet painted to go with (match) your bike if your bike has a unique or specific theme or look. Or similar to why many get a tattoo, you can get a design to commemorate or represent something meaningful. 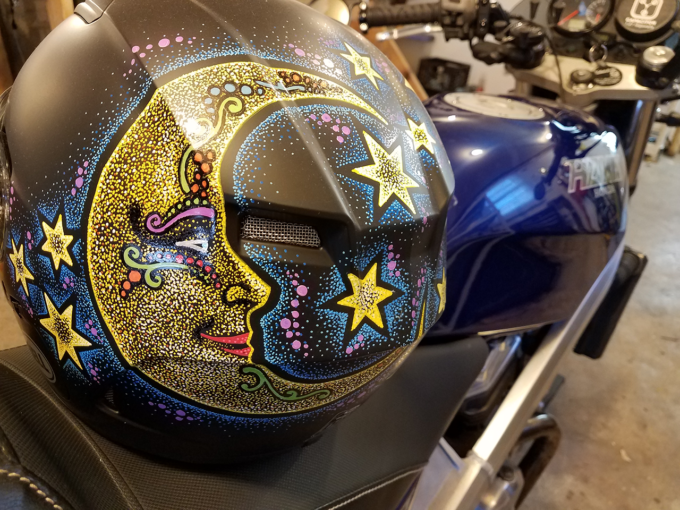 Custom painting my helmet = something special + no one else can buy off the shelf + expresses a side of me + would look rad + affordable. 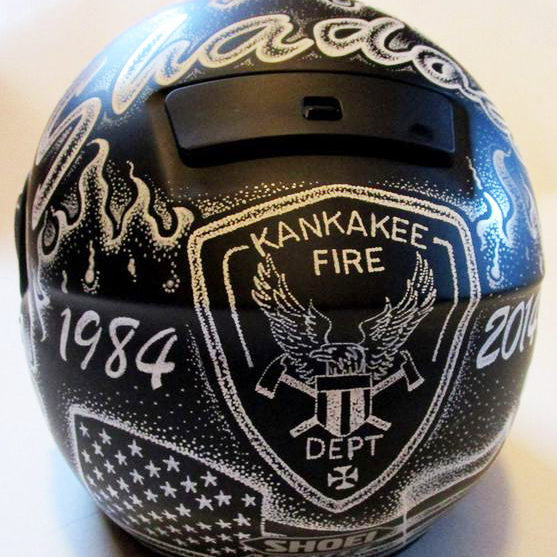 Sara started painting helmets when a friend asked her to cover the empty canvas of his helmet in 2013. She was up for the challenge and started testing different methods, applications and paints. 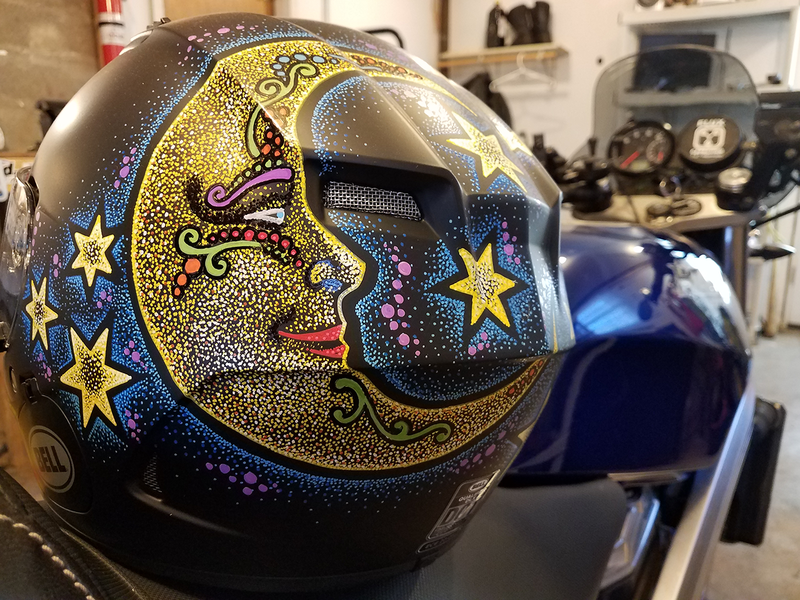 Sara found a unique approach differentiating her from most helmet artists who use airbrush or striping. Sara applies her custom designs with paint markers using the technique of pointillism. Her process is waterproof and permanent with no need for clearcoat. She also does not need to disassemble your helmet to apply the paint. 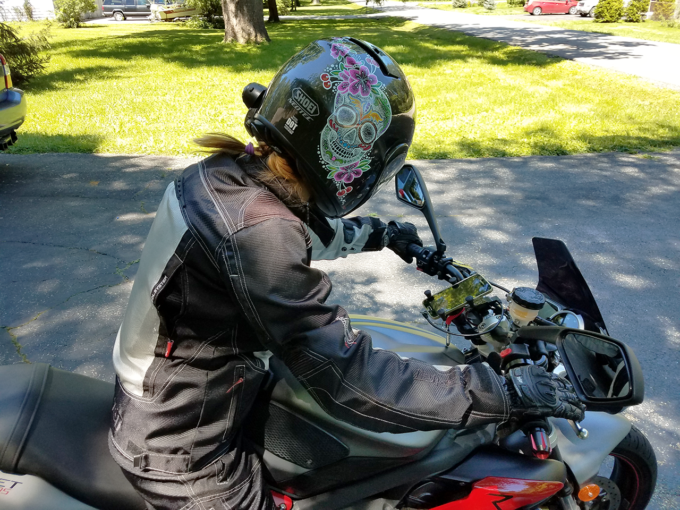 Sara confirmed with Snell this means her approach does not destroy, alter or minimize the crash safety rating or effectiveness of the overall helmet. Her artwork bears no more effect than applying a sticker or decal would. Email or reach out to her through Facebook or her website. She conceptualizes your design and emails a description of what she envisions. This includes color(s), sizing and placement on the helmet. Once the design is accepted, she gives a price quote. Once you’ve both reached agreement on the design and price, you make arrangements for transfer of your helmet to her. She’ll give you an estimated time of completion and updates you when completed. You receive your finished helmet. My first helmet was a $99 Hawk special. Nothing wrong with that, it was a budget beginner helmet. My days of Hawk helmet wearing were also when I strictly rode pillion. This was not the helmet to get custom painted. My current helmet is a Shoei Neotec modular model. This helmet is worthy of artwork and needed it. The color is anthracite, a non-matte deep grey. 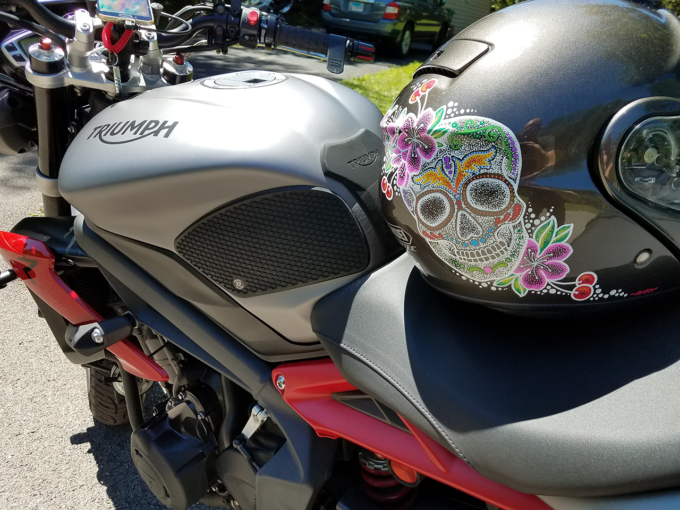 I wanted a sugar skull, offset in the back and bottom right of my helmet. I wanted the skull a “reasonable” size, not too small, not too big. I also wanted cherries in there somewhere. Robin suggested a moniker on the front bottom left of my helmet. Colors should pop. Okay Sara, now go! 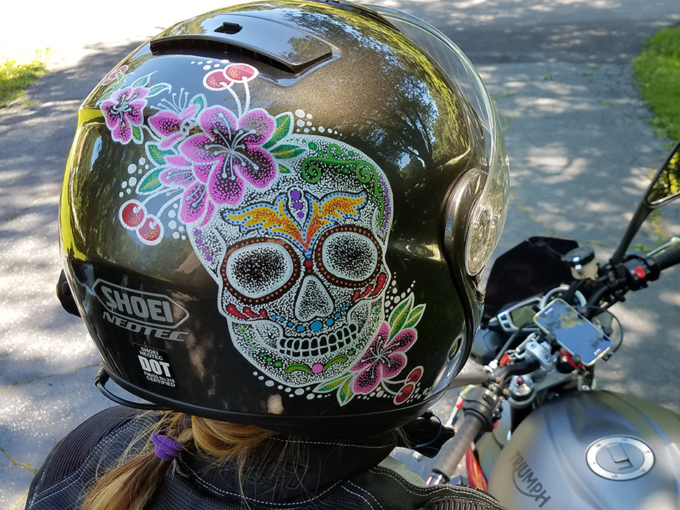 Sara began helmet painting when a friend asked her to custom paint his motorcycle helmet in 2013. She agreed and tested methods, applications and paints. Sara’s love of Mexican folk art means calaveras are right up her alley. Her pricing is fair and affordable in part because you supply your own helmet. 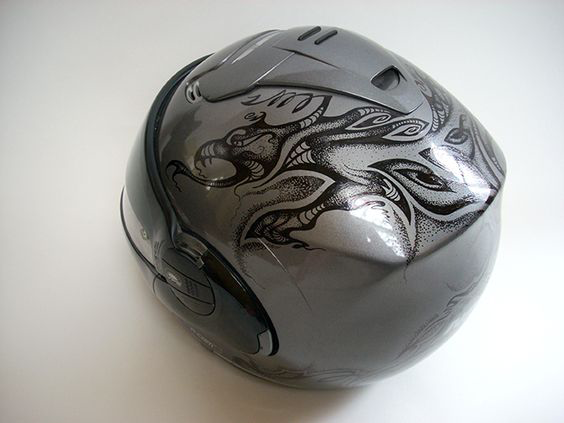 Many sites offering custom airbrush painting sell you the helmet with the paint job. Our communication process was easy because I gave Sara artistic freedom to bring my concept to life. Sara can work with you whether you give her the freedom or whether you have specific design elements you want carried out in a specific way. 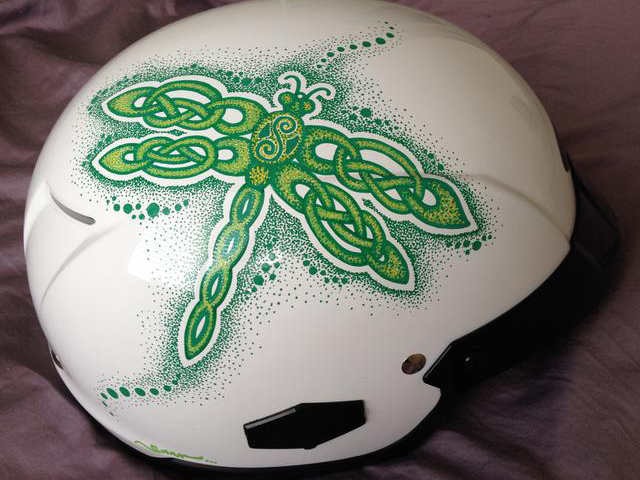 As a trained and experienced artist and graphic designer, she knows how to make your helmet look good. 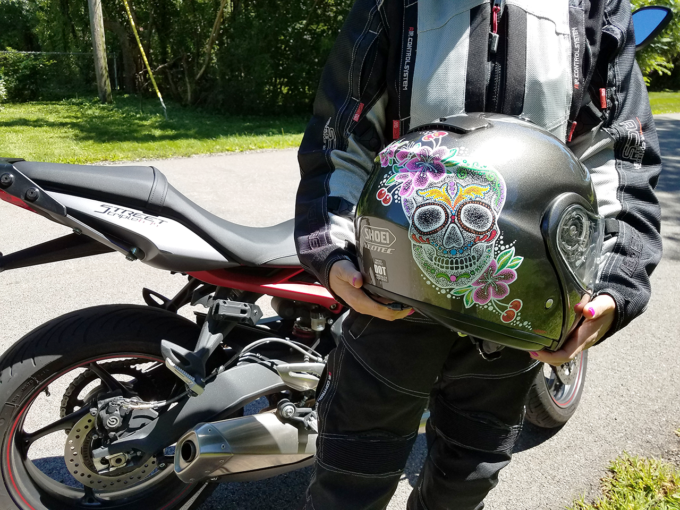 I loved my helmet so much I sent Sara my back-up helmet to paint, a Bell Qualifier in matte black. Watch this Instagram video about the helmet pictured above! Helmet makers are starting to release more versions of graphic helmets to give riders more expressive and high-vis choices. AJV’s K3 line has models with graphic titles like “Gothic” and “Dreamtime” or the Rossi replica models. Bell’s Vortex Flying Tiger and Shoei’s X-14 line also come in wild color schemes and graphics. 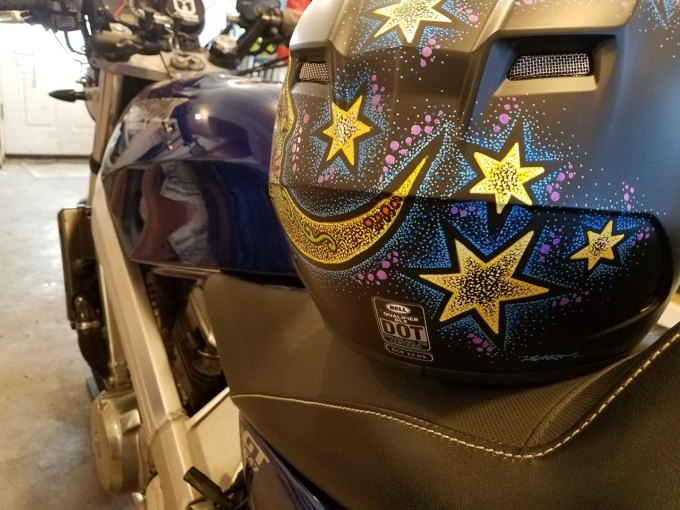 Arai’s Corsair X models and HTC’s Marvel graphics helmets are similar to what a custom airbrush helmet artist could do for you. These are not bad options if you have the budget and don’t want to wait for custom paint. 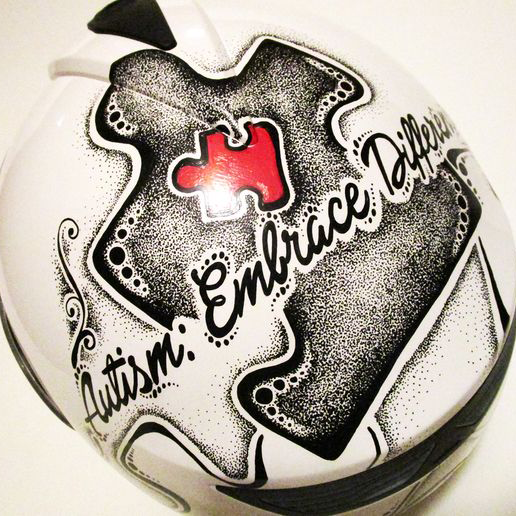 But if you’re looking for something that is yours and only yours, consider custom painting your helmet. You can find helmets in basic colors from any brand on sale somewhere. Spend the additional cash on custom wearable art. An understood and large component of riding, is how we represent. Riders spend all kinds of money personalizing their ride and gear. If you’re going to ride safely wearing the best helmet you can afford, why not make your helmet look good? Or say something significant or meaningful? Sadly, I’ve run out of helmets for Sara to paint. Did I mention it’s addictive? What Custom Visuals Have You Applied To Your Gear (Or Bike)? There’s room for expression in motorcycle gear. What artwork have you incorporated? What inspired you to do so and why? Your input is invited. Post an article! "Girl spectates through life no more" - Those six words capture it all. I used to spectate. I was one of the watchers of the doers of things. Then I became a doer.